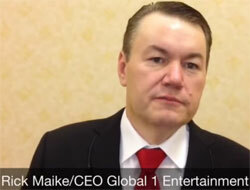 Following criminal charges filed against Richard Maike back in April, Maike, his wife and several top Global1Entertainment affiliates have been indicted. Named in the indictment are Richard Maike, Doyce Barnes, Richard Anzalone, Faraday Hosseinipour, Dennis Dvorin and Jason Syn. Maike’s wife Angela R. Leonard-Maike is also a named defendant. For those unfamiliar with the company, Global1Entertainment was a reboot of the Infinity 2 Global Ponzi scheme. Richard Maike (right) launched Infinity2Global in late 2013. By mid to late 2014 the scheme had collapsed, prompting a relaunch as Global1Entertainment. Global Entertainment barely lasted six months before showing signs of collapse again. Richard G. Maike, Doyce G. Barnes, Richard J. Anzalone, Faraday N. Hosseinipour, Dennis Dvorin and Jason L. Syn, and others known to the grand jury (“the co-conspirators”) engaged in a $25 million dollar “pyramid” scheme, operating under the name Infinity 2 Global or I2G, by representing that investors would receive a return on investment based upon an on-line internet gaming site called i2gcasino. Maike, Barnes, Anzalone, Hosseinipour, Dvorin, Syn, and others unnamed in this Indictment, falsely represented that Infinity 2 Global, or 12G, was generating massive profits from its on-line internet gambling site and that the public could share in such profits through the purchase of a $5,000 “Emperor” position in 12G. In truth and in fact, Infinity 2 Global’s purported profits were bogus, and 12G was operating as a fraudulent pyramid scheme in which inflated returns were paid to early promoters in order to induce later victim-investors to invest in the company. As a result of the co-conspirators’ scheme and artifice to defraud, victims worldwide lost at least $16 million. Back in 2014 Ted Nuyten’s BusinessForHome identified Faraday Hosseinipour as a “top earner” in Global 1 Entertainment. Faraday Hosseinipour and David Manning from Jacksonville, Florida, USA are one of the top earners in Global One Entertainment (G1E). G1E is a direct sales company which has monetized the most exciting global trends and digital online entertainment products such as Fantasy Sports, Online Games and Social Media Technology. Faraday and Dave have a team of approx.18,000 members and have earned along with their partners Richard and Susan Anzalone about $2.3 million in 1 year. Faraday and David have 5 millionaires created on their team and 6 members are over $500,000. More then [sic] 50 members are over $100,000. All in 1 year. A month later in another article Nuyten claimed Richard Anzalone had made “about $2.3 million in a year” through Global 1 Entertainment and Infinity 2 Global. Over 2014 and 2015 Ted Nuyten published five articles helping to promote Global1Entertainment. Whether any money exchanged hands is unclear. Today Faraday Hosseinipour identifies herself as a “founder and owner” of Travelution. On April 3rd Richard Anzalone was appointed to Vitaxel’s Board of Directors. BehindMLM’s respective reviews of Travelution and Vitaxel identified both opportunities focused on affiliate recruitment over retail sales. I wasn’t able to find any recent business related information pertaining to Barnes, Dvorin or Lyn. As a result of either operating and/or promoting the Infinity 2 Global Ponzi scheme, Maike and top affiliates were indicted on one count of conspiracy to commit mail fraud and eight counts of money laundering. forfeit to the United States, any and all property constituting or derived from proceeds the defendants obtained, directly and indirectly, as a result of these offenses, and any and all property involved in the commission of these offenses. Assets named in the forfeiture notice include $153,850 USD, a Silver 2005 Rolls Royce Phantom and real-estate in Kansas. Prior to criminal charges being filed against Richard Maike back in April, a defamation lawsuit filed against Chuck King had been playing out. In 2015 King claimed Maike and Global1Entertainment were under FBI investigation, which was confirmed in September, 2016. With Maike arrested and charged with mail fraud and structuring back in April, you’d think that’d be the end of the defamation suit. The DOJ seemed to think so, having filed a Motion to Intervene. The DOJ asked the civil suit against King be dismissed and the case was dismissed on April 14th. Given the DOJ’s motion was filed on April 13th, it was assumed this was the reason the case was dismissed. Turns out that’s not the case, as per a motion to disqualify an Assistant U.S. Attorney working the case. On Friday, April 7, 2014, the parties reached an agreement in terms. The parties agreed to dismiss the Defamation Action and neither party would pay any money. Mr. King offered – and Mr. Maike accepted – that if Mr. Maike was convicted in a criminal action, the settlement would be null and void. In return, the parties agreed to a consent judgment that included a liquidated damages provision, whereby if Mr. King violated the agreement, he would be responsible for $1,700,000 worth of damages to Mr. Maike’s company. Mr. King also agreed to sign an affidavit that stated his intention to destroy Mr. Maike’s company, Finance Ventures. However, immediately prior to executing the settlement, Mr. King abruptly cut off communication. The next week, Mr. King reversed course and refused to sign the settlement agreement and affidavit. Unbeknownst to Mr. Maike and his attorneys, during these negotiations, Mr. King was in contact with the lead investigator in this criminal action, FBI Special Agent Dave McClelland (“SA McClelland”). SA McClelland advised Mr. King that the settlement agreement and affidavit would significantly hurt any criminal prosecution of Mr. Maike. SA McClelland instructed Mr. King to refuse to sign a consent judgment that included a monetary figure of loss caused by Mr. King’s videos. SA McClelland further advised Mr. King to counter-propose an affidavit wherein Mr. King testified that the statements had not been proven as fact. Mr. King also demanded that the settlement agreement would be null and void if Mr. Maike was convicted or plead guilty based on statements by Mr. King. Assistant United States Attorney Marisa Ford filed the April criminal complaint against Maike. At a hearing for the defamation case on April 14th, Ford told the Judge the proposed settlement between Maike and King might impact “the integrity of the government’s case”. My fear, Judge, is that because (King is) representing himself, I don’t know what he will admit to … What I’m trying to avoid is then Mr. Maike being able to later at trial to wave around documents in front of a jury and say that the only reason his business failed is because Chuck King posted videos on YouTube. Maike claims Ford has breached the Ethical Standard for Prosecutors Act by ‘providing legal assistance in any case in which the United States is a party of has a direct and substantial interest‘. As a result he’s requested Ford be disqualified “from further participation” in the case. What impact the June 14th indictment might have on Maike’s motion is as of yet unclear. Footnote: The indictment as filed appears to misspell Faraday Hosseinipour’s surname as “Hossienipour”. I’ve edited the surname where it appears to reflect the correct spelling as per Hosseinipour’s Facebook profile. Update 24th June 2017 – As per the case docket an arraignment has been scheduled for June 29th. Update 1st July 2017 – All five defendants have plead not guilty. A jury trial has been scheduled for August 28th. I don’t think Paul burks deseve’s 14 years. People made fortunes and the shutdown hurt people the most. However the message is crystal clear. Investment based mlms r not legal, get shut down and owners vigorously pursued. This is sad but this is reality. All u can do is take the lessons to heart. I am sure he never foresaw anything like this happening. Incredible IRONY…Faraday defending another crook before learning that she has been INDICTED by a Grand Jury in Kentucky…. Incredible band of “sociopathic” MLM CROOKS ! It’ nice to see that occasionally JUSTICE is served…. Bruce, please remember that indictment is not the same as conviction. Yu….not to worry…the FBii has enough information to put all of them away for years.. Article updated with news of arraignment. all is fine but they need to prosecute global payroll gateway for knowingly being their affiliates payroll and gateway processor. knowing that they were a scam and looking the other way. jamsheed amirie was once tried and charges were settled in a former telecom scam. if you ask me how a man that was charged but not convicted is allowed to take on mlm companies and process their credit card enrollments and so much more, GPG is just as guilty by association. Is there any update to this court case?